From concept to final art files, Route 1 Design provides professional graphic art services for print, Internet, and special event promotion. If you are considering an experienced graphic designer skilled in branding, advertising and event promotion design, please contact Route 1 Design for an explanation of the creative process, a discussion of your expectations, the results you can expect, and an estimate for the completion and cost of your project. If you live and work in Rhode Island, you're a neighbor. 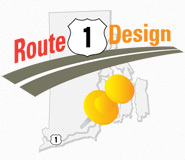 Route 1 Design is based in southern Rhode Island. Choosing to use a local art resource doesn't mean you have to sacrifice quality. Route 1 Design offers professional illustration and design services based on over twenty years of branding, advertising, and marketing experience. If you are considering a local graphic designer, please contact Route 1 Design to arrange a meeting. you can expect the creative process to be uncomplicated, effective, and enjoyable! I hope Route 1 Design is your first choice every time you need professional graphic design services." Route 1 Design may be a small art studio but it is big on consistently delivering professionally rendered, high quality graphic design guaranteed to assure your complete satisfaction - every time. Route 1 Design provides graphic design services for branding, printed collateral, online advertising and event promotions, as well as providing marketing consultation to help assure effective implementation of the creative products. Trust Route 1 Design to create effective visual solutions designed to successfully enhance your brand and the goals of your marketing project. Great graphic design equals great marketing results. Timely, professional, cost-effective design and consultation services are provided to meet your specific needs and expectations. Quality graphics coupled with marketing and advertising experience guarantee effective, targeted visual solutions. Route 1 Design has developed a creative process that assures consistent results and satisfied clients, guaranteed. The businesses, organizations and clients that have chosen Route 1 Design are diverse and include resorts, restaurants, yacht chartering companies, newspaper and magazine publishers, health services, real estate developers, interior designers, insurers, boat builders, public relations firms, contractors, online sales, not-for-profit groups, botanical gardens, community associations, special events organizers, vineyards, travel agencies, chambers of commerce, professional dog breeders, employment agencies, and a variety of entrepreneurs. Route 1 Design would be happy to add your specialty to the list! Creative Services include: graphic design, illustration, logo design, stationery and business card design, advertising design, catalog, brochure, insert and flyer design, direct mail design, invitation and greeting card design, poster design, special event promotion and merchandise design, website and Internet conceptual design, marketing consultation. Customer Service is a priority at Route 1 Design. Route 1 Design works with you to coordinate all the promotion elements needed to make your project a success. At Route 1 Design, you can expect the creative process to be uncomplicated, effective, and enjoyable! Your design project will be delivered on time and within budget. If you are considering a graphic designer, please contact Route 1 Design with any questions. Route 1 Design will explain the creative process, estimate how long your design project will take, the cost, and define the results you can expect. Choose Route 1 Design for personalized, punctual, professional graphic design services priced to fit your budget.